How Do I Start Getting Referrals If I Don’t Yet Have Any Paying Clients? They have no idea where to start and they know that! It’s key to understand this one principle! 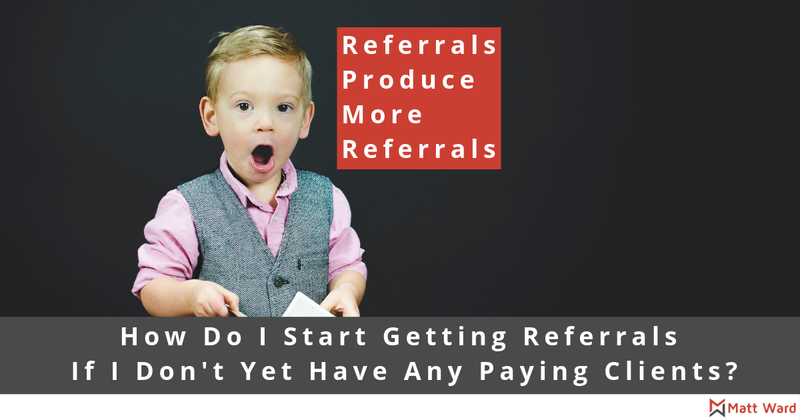 Referrals produce more referrals. One thing that would be ideal is to start finding ways to refer others to people you know. Connecting people makes you a connector, and it produces referrals for you to give to others that you know. When you show that you are invested in the relationship with others, then they will see that and start to send referrals your way. The challenge with this approach is that it takes time and I suspect the individual asking the question above is ideally looking for a process that takes less time than this. Well, there is another one, which I will share with you, however, I need you to know that this step is a huge part of the process. If you don’t do this, then your referral well may run dry! So start by looking for opportunities to refer others and to connect them together! Now that I’ve covered the major foundational step in the process I’ll share with you a short term approach. I call this approach my Linkedin Catchup Call Program. Here’s the process you need to follow to ensure it works. Determine who is active – This is easy, when you see posts or comments from people, you know that they are active. Starting here is an important step in the process because if you send messages to inactive users on Linkedin this process won’t work at all. Send a standard message to the active user via the message tool in Linkedin. Here’s a sample I would recommend. Note that the name is customized. I wanted to check in with you to see what you are up to these days, what’s new, and what’s changed in your world. I recently made a big shift in my business and would love to share with you what I am doing now. Do you have some time this week or next week for a zoom video chat? When you answer…under no circumstances should you pitch or attempt to sell anything. Simply “inform” them on what you are doing. Half the battle of referrals and ensuring that people know you exist. Referrals do come from just that understanding alone! Take notes during the call, it will help you understand more about them. Add the note to your CRM (Customer Relationship Management) Software. If you don’t have that, then you need to get SWELL! (Note: I get a referral fee if you signup). I’m starting to use SWELL and it’s the most comprehensive all in one business suite for small businesses, in my opinion! I actually volunteered my time and expertise as a software tester for the team because I believe in the product so much! End the call on time. If you have their address, send a thank you card for their time. Set a reminder in your CRM to reach back out again in 90 days. This process, done systematically, will produce referrals for you. I know that because it’s the exact process I used when I started my speaking business. Of note, I’ve referred out more than I’ve gotten in, but I’m completely OK with that and you should be too! Play the long game, you won’t be sorry!